We’d love your help. Let us know what’s wrong with this preview of Amelia Bedelia by Peggy Parish. To ask other readers questions about Amelia Bedelia, please sign up. I want to read it? I like things like soccer hi? Recently read this to my daughter, and I almost forgot how much I enjoyed these books as a child. Amelia Bedelia -- such a literal character -- always taking every word at face value, never able to read between the lines...and I still find her well-intentioned antics heartwarming and hilarious! My daughter seems to agree. Great childhood read! Once upon a school day, I think when I was in second grade (so this would have been pre-1980, I believe), we went on our bi-weekly library outing. The librarian had us sit in front of her in the storytime area and whipped this book out. She read it to us. That may have been when I realized my love for wordplay. I don't think I'd ever laughed so hard in storytime in my life. That librarian read us a lot of good books (Cloudy With a Chance of Meatballs, Charlotte's Web(that was in third grade and it Once upon a school day, I think when I was in second grade (so this would have been pre-1980, I believe), we went on our bi-weekly library outing. The librarian had us sit in front of her in the storytime area and whipped this book out. She read it to us. That librarian read us a lot of good books (Cloudy With a Chance of Meatballs, Charlotte's Web(that was in third grade and it took several weeks to finish), and others) but this one is the one that stuck with me for years. The sponge cake? Drawing the drapes? And the best part was that I understood Amelia's blunders, I got why it was funny and it warmed this little spot in my brain, in my heart, and in my soul which was not yet blackened and shriveled. Four stars today, adding a fifth star because of how much I loved this as a child. And it's still hard not to like Amelia Bedelia. She is such an adorable, unintentionally funny individual, so earnest. It's hard to really be mad at her for doing what she thought was right, though she makes a mess of things (I'm sure many kids can relate to that!). I always loved her ruffled lacy apron and blue hat with the pink flowers on it. The illustrations fascinated me with all the old-fashioned furniture an Four stars today, adding a fifth star because of how much I loved this as a child. I have a confession to make: even though I had read the “Amelia Bedelia” books when I was little, I had never read the very first book in the “Amelia Bedelia” series, which has surprised me since I thought that that would be the first thing that I would have read (but, I was a kid back then and I just read whatever was put in front of me). 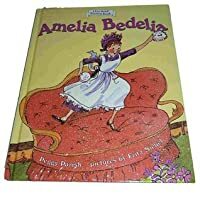 So, I finally got the chance to read the very first book “Amelia Bedelia” by Peggy Parish along with artwork by Fritz Siebel and I was pleasantly surprised by this introductory book into the popular “Amelia Bedelia” series! Instead, Amelia Bedelia took some dusting powder from the bathroom and dusted the furniture with it. How much more damage will Amelia Bedelia cause in the Rogers’ household? I cannot believe that I waited until just recently to actually check out the very first book that jumpstarted the fantastic “Amelia Bedelia” series! I was quite impressed with how simple yet hilarious this story was and it is clear to see why the “Amelia Bedelia” series remained to be well -loved by children all over the world! Peggy Parish did a great job at writing Amelia Bedelia’s character as Amelia Bedelia remains to be a charming and likable character who usually takes things extremely literally and the fun in the story is seeing Amelia Bedelia do bizarre things with the chores she has to do around the house, such as a simple task of putting out the lights turn into Amelia Bedelia literally putting the lights outside to dry out in the sun. 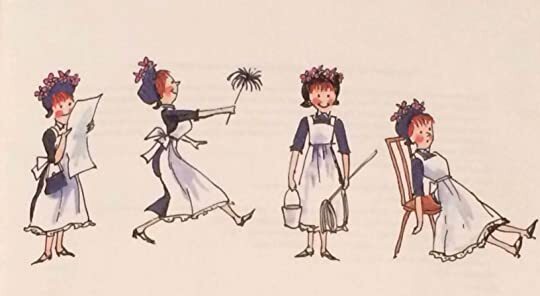 Fritz Siebel’s artwork is simplistic, yet cute at the same time as Amelia Bedelia is always drawn with an innocent look on her face and is always wearing a black dress with a white apron in front, signifying her status as a maid. I also loved the way that Fritz Siebel illustrated Amelia’s escapades in the Roger household, especially the scene where Amelia is dressing up the chicken as they were hilarious to look at. I also like the fact that the colorings are mainly in green and white colors as it makes it truly stand out from other children’s books that usually have black and white colorings in the artwork. 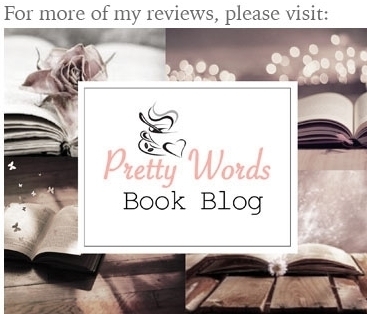 The reason why I took off half a star from the rating was that I felt that the pacing was a bit slow in some places and I sort of wish that they trimmed down the activities that Amelia Bedelia has done around the house just so the pacing would be faster. 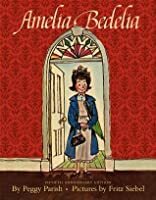 Overall, “Amelia Bedelia” is a must read if you want to read about how Amelia Bedelia’s adventures began and if you are a huge fan of the “Amelia Bedelia” book series! I would recommend this book to children ages five and up since there is nothing inappropriate in this book. So sweet! I love a good throwback, and this little book definitely spanned a couple of decades to replant me in my childhood, if only for a few minutes. It's fun revisiting an old friend like Amelia Bedelia! This book seriously stressed me out as a child. It was funny, but I was concerned about how much she always messed up! This is a combined review of mom and daughter. I think as I child I loved this one as much as my daughter. As an adult, a little bit less because of the repetitiveness in the read aloud. I found myself wanting to just say Amelia instead of Amelia Bedelia. However, I still would happily continue reading this to my little one. Amelia Bedelia is hilarious fun. She doesn't quite get what is being asked of her on her first day of work. She does everything on a list made by her new employers, but she d This is a combined review of mom and daughter. I think as I child I loved this one as much as my daughter. As an adult, a little bit less because of the repetitiveness in the read aloud. 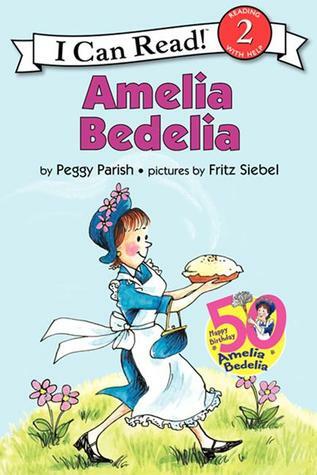 I found myself wanting to just say Amelia instead of Amelia Bedelia. However, I still would happily continue reading this to my little one. Amelia Bedelia is hilarious fun. She doesn't quite get what is being asked of her on her first day of work. She does everything on a list made by her new employers, but she does it in her own silly way. My daughter is a little young for understanding all the puns, but each time I read it I giggled at parts and told her why it was funny. She gets it now. I explained what it means to draw the drapes vs draw the drapes, etc. Her asking me to read the book 5 times in a short period of time lets me know she really enjoys it. I love Amelia as much as when I read my first Amelia Bedelia book. She's quirky, she's hilarious, she's kindhearted, and she's a hard worker. I can't help but wonder when are they going to make an Amelia Bedelia movie? This is the first book of the Amelia Bedelia series and I can't believe it's over 50 years since it was written! The illustrations are cute and she is so funny! It's her first day at work as a maid for the Rogers family. They gave her a list of chores to complete when they go out, but she takes everything so literally that she messes all up! They end up "forgiving" her because she made the most amazing lemon pie. I giggled when she "dressed the chicken"... in a cute little jumper! This was one of my favorite childhood books. This also explains a lot about me and my opinon on the English language. Silly but cute.. My little one liked it. Amelia Bedelia has cracked me up for most of my life! I remember this one being read to me long ago, and I just laughed hysterically along with my teacher as the mishaps were explained. It's an incredibly effective and creative idea by Peggy Parish to help teach the difficulty and silliness of our language. There's certainly no better character to stumble through the misinterpreted nuances of it than Amelia Bedelia! Later in life, when conversation turned to books one read as a child...and after exhausting my fond memories of Frog and Toad...I recalled this character. "You're pronouncing it wrong. It's Uh-mee-lee-ah Buh-dee-lee-ah. Hold on." "Making sure I didn't miss taking my pill." So, note: "Amelia Bedelia" doesn't rhyme with "Oh-Hell-yeah Regalia". 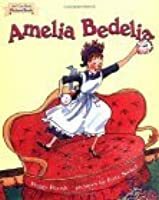 Amelia Bedelia, written by Peggy Parish and illustrated by Fritz Siebel, is an easy-to-ready story with a mixture of dialogue, action, and different text (written cursive and typed text). The meain character is Amelia Bedelia and she is a silly maid who takes everything literally. She is hired by Mrs. Rodgers to clean her home and prepare dinner while Mr. and Mrs. Rodgers are out. Amelia Bedelia performs every item on Mrs. Rodger's list exactly as it says-even going to extra to bake a Lemon Mer Amelia Bedelia, written by Peggy Parish and illustrated by Fritz Siebel, is an easy-to-ready story with a mixture of dialogue, action, and different text (written cursive and typed text). The meain character is Amelia Bedelia and she is a silly maid who takes everything literally. She is hired by Mrs. Rodgers to clean her home and prepare dinner while Mr. and Mrs. Rodgers are out. Amelia Bedelia performs every item on Mrs. Rodger's list exactly as it says-even going to extra to bake a Lemon Meringue pie. When the Rodger's return they find their house a mess, but some wonderful pie. 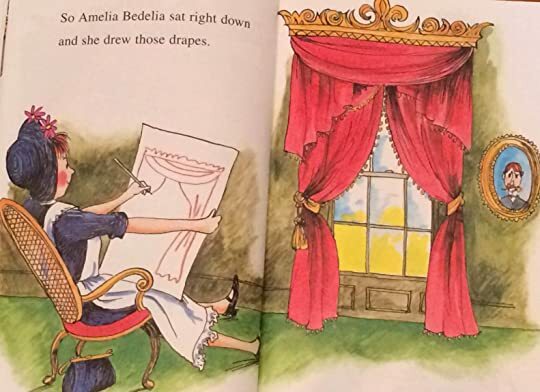 The illustrations in this book are sketch-like, cartoon-ish, and roughly generalized according to actual dimensions of objects, that being said, Siebel has a one-of-a-kind portrayl of Amelia Bedelia. The faces of the characters are simplistic, only providing the young reader with generalized happy/puzzled/surpsed/angry faces. 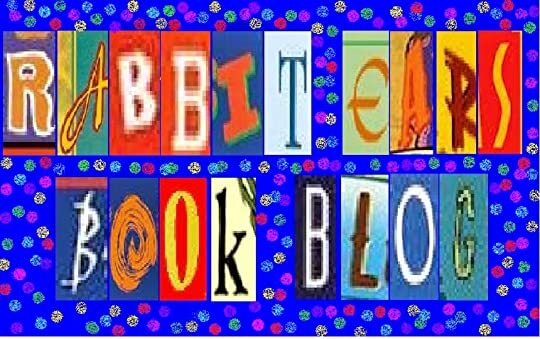 Siebel only shows what the reader needs to know from the text-teaching the reader how and what to imagine what the words are describing. Siebel gives some ornate details such as an old wood burning stove and stylized lamps. Siebel creates a wonderful image of Amelia Bedelia. Recommends it for: Everyone, yo. Overly literal maid Amelia Bedelia begins a new job and gets everything wrong. One of the joys of parenthood is that it serves as a motivation to pick up exceptionally good children's classics that one has heard of, but missed during one's own childhood. And a second joy is sharing them with an eager and appreciative audience. DS#1 (age 5) and DD (age 3) both demanded an immediate reread the first day, and then cadged an afternoon and evening reading on the second. It's been in heavy rotation sin Overly literal maid Amelia Bedelia begins a new job and gets everything wrong. DS#1 (age 5) and DD (age 3) both demanded an immediate reread the first day, and then cadged an afternoon and evening reading on the second. It's been in heavy rotation since. DS#2 (17 months) inexplicably also regards it as a favorite. There's a dog on the first page, a sure sign of quality literature (when reading the book, we turn back a couple of times and admire it). Perhaps he also likes the pleasing euphony of Amelia Bedelia's name? This story was selected as one of the books for the November 2012 - Classic Picture Book Characters reads at the Picture-Book Club in the Children's Books Group here at Goodreads. I was bored today while they were taking out the trees at grandma's, and I have this from when I was little. My 1st grade teacher gave it to me. So I decided to read. I was looking through some of my childhood books to read to a couple classes at school seeing as it's reading month and I'm going to be a guest reader. Still love it. Although it's not the book I'm going to be reading. But so fun to read, plus a teacher gave it to me when I was done with first grade and wrote a nice note inside. This book is the funny story of a maid on her first day of work. Her boss, Mrs. Robinson, can’t be there on her first day of work, so she leaves Amelia Bedelia a list of tasks to accomplish during the day. She does everything exactly as the list says. When the list says “dust the furniture” she puts Mrs. Robinson’s dusting powder all over the furniture. From literally drawing the curtains to dressing the chicken by putting clothes on it, she follows the list exactly. However when Mr. and Mrs. Robinson come home, they’re shocked by the state of their home. They’re angry with Amelia Bedelia until they taste the delicious pie she made. In the end, they realize that they need to be clearer in order to avoid miscommunication in the future. The illustrations in this book really help show what’s going on in the story, which would be helpful for young readers who may not know all the words on the pages. Some students may not pick up on the double meanings of words, but the pictures help to clear up the confusion. At one point, I was confused about how Amelia Bedelia understood the word “trim”, but after looking at the picture, I understood. A fun book for children learning the English language. As a third grade teacher for 30 years this was one series that we read to illustrate the use of puns and idioms. These books are funny if you let yourself drift back to your younger years. This was a lovely book, I enjoyed reading Amelia's interpretations from the list of jobs left by Mrs. Rogers. She takes everything literally, as kids often do, with very funny results. I think this would be a great book in a classroom setting. This young lady drives me up a wall. And if Amelia Bedelia read that, she would literally try to drive up the wall. Opening line/sentence:"'Oh, Amelia Bedelia, your first day of work, and I can't be here. But I made a list for you. You do just what the list says,' said Mrs. Rogers." Brief Book Summary: Amelia Bedelia focuses on a new maid who is given a list of tasks to do for her new employers while they are away. Although they left her simple things to do, the books follows her doing every task incorrectly because she takes it too literally. Response to Two Professional Reviews: In this book, the images help readers understand what exactly Amelia did that was wrong, so I agree that the added illustrations really help the story. It’s a humorous tale that children continue to enjoy. Evaluation of Literary Elements: The images in this story are useful in helping readers picture what is happening, so the colors in them are mostly primary so they fulfil their basic function, and I think that works really well for them. As for the story, it’s written in a way that holds the humor, but younger children can still understand the funny parts of it. Consideration of Instructional Application: A mini-lesson on this could be the difference between literally and figuratively because she does everything literally when she shouldn’t be. To extend the lessons, students could correct what she is doing so they understand how to clean the right way. To spread it into other content area, you could have the students discuss what else she could have done, or what she could’ve done to fix it in order to exercise their problem solving skills. I'm making my way through Amazon's 100 Best Children's Books to Read in a Lifetime. 9 down. Amelia Bedelia is a fun and silly character that beginner readers enjoy reading about. I can't believe this was required reading, but I'm not complaining. Peggy Parish was the author of the children's story series Amelia Bedelia. The series was continued, after her sudden death from an aneurysm, by her nephew Herman Parish. Peggy attended the University of South Carolina and received a Bachelor of Arts degree in English. Herman honored Peggy's life in his book, Good Driving, Amelia Bedelia, by writing in its dedication: "For Peggy Parish, the real Am Peggy Parish was the author of the children's story series Amelia Bedelia. The series was continued, after her sudden death from an aneurysm, by her nephew Herman Parish. Peggy attended the University of South Carolina and received a Bachelor of Arts degree in English. Herman honored Peggy's life in his book, Good Driving, Amelia Bedelia, by writing in its dedication: "For Peggy Parish, the real Amelia Bedelia."